Well today I’m back in action and here to say, we have TWO out of the last three cabinets finished. I knew a huge weight was going to be lifted off of my shoulders once these were done, but I didn’t know just how much I would love them until now. Friends, they are a game changer in our kitchen. First, check out the pots and pans drawer. We actually have a drawer! In the very early stages of planning this kitchen layout, I knew I wanted this drawer. If you don’t have a large drawer in your kitchen, write this one down in your ‘someday’ file. Or PIN it on Pinterest for later. I promise you’ll love it. Not only does it pull out as smooth as can be, but it holds SO much stuff. I mean my entire set and the cast iron pot fit inside. And there’s still more room. Moving on. It gets better. Before this new drawer cabinet, our spices were on the lazy susan. You could never find what you needed because it’s dark inside, spices are hiding behind each other, and quite honestly, I’m short and I couldn’t always see the stuff on the second or top shelf. Now, all the spices are right next to the stove. 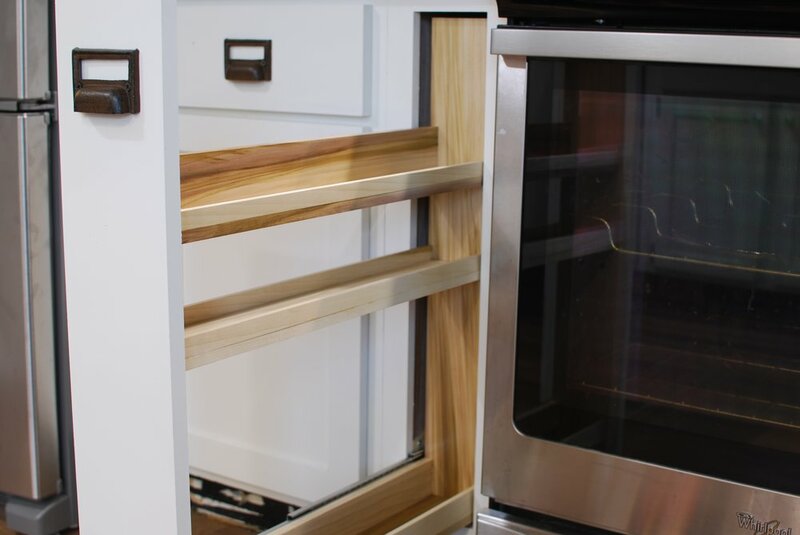 There's no walking back and forth across the kitchen, turning that silly lazy susan and searching for the right one. This is making me more lazy life changing. All of the oil bottles are in one place, nicely lined up in a row. It’s like a organizer’s dream come true. So, we’re making progress. Things are looking promising that this kitchen will be finished by Christmas (last Fall when I said we would be done by Christmas, I never said which Christmas)! 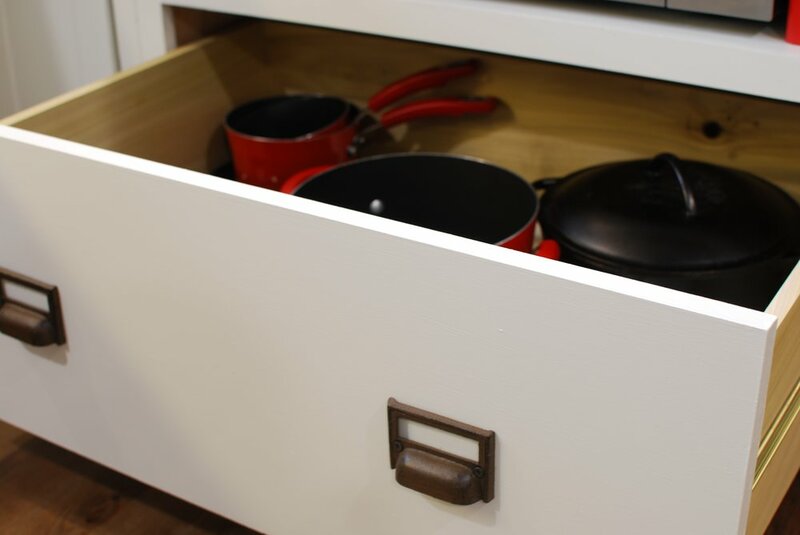 These two drawers may seem like a small task in the entire kitchen project, but today I’m appreciating how much thought and effort went into them. I will give Bryn all the credit for these. Well, maybe not all the credit. I had the ideas, he brought them to life. Thanks love bug, you’re the best. Many of you have asked for plans for these drawers. 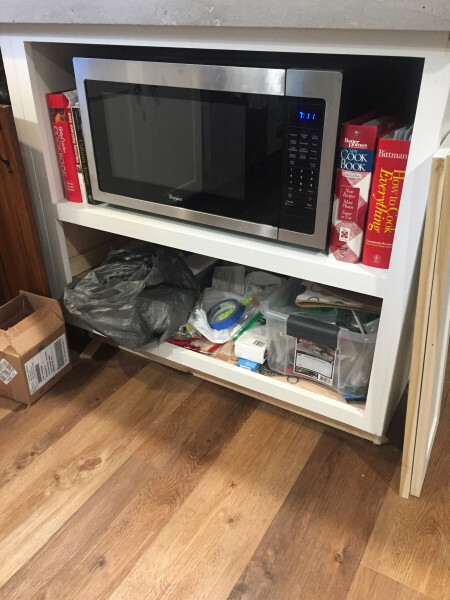 Unfortunately, these cabinets are not a 'typical size', because they were custom built for the space we had. Below is a PDF with a picture breakdown with more information to help you build one for yourself! For more behind the scenes pictures and videos, follow me on Instagram (greywoodmama)! Don't have time to do this now? PIN it for later!